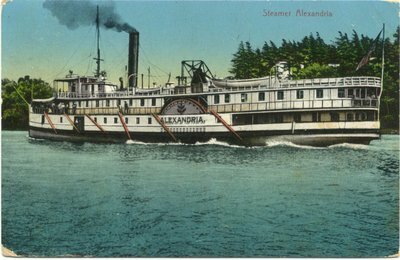 Coloured postcard of the Ontario & Quebec Navigation Company steamboat ALEXANDRIA (ex-ALEXANDRA) on the Bay of Quinte. The ALEXANDRIA was wrecked off the Scarborough Bluffs near Toronto on the 3 Aug. 1915. Divided back. Postmarked "Picton, Ont., 24 Jul 1911"
This specific card is featured on the front cover of Maurice Smith's Steamboats on the Lakes , 2005. Reverse: "Published by Gordon, MacKay & Co., Ltd., Toronto, Ont. No. 44 Made in Germany"
Gordon, MacKay & Co. Ltd.